Home / Latest news / Wake Up and Smell the Waste! Wake Up and Smell the Waste! 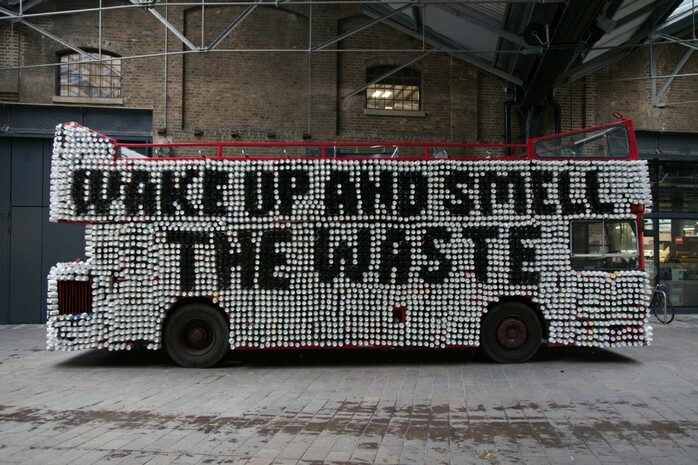 It’s estimated that 2.5 billion “paper” coffee cups are being thrown away in the UK every year . That’s almost 5,000 a minute, or 7 million per day. • Amazingly, hardly any of them are being recycled – less than 6 million cups a year, which is less than one day’s worth – less than 1/4 of one percent. • The UK’s biggest coffee sellers are doing very little to address the problem, says TV presenter and Waste campaigner Hugh. • The two biggest coffee companies in the UK, Costa Coffee and Starbucks, both have misleading messages about waste on their websites, he claims. 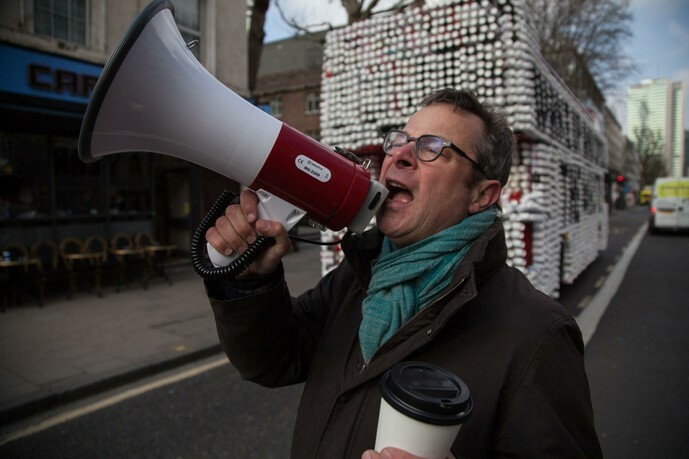 • On Monday 14 March, Hugh takes to the streets of London in his “coffee cup battle bus” to tell the public about the problem, and challenge these companies to come clean, and do better. Many of us who pick up a hot coffee from Starbucks, Costa, Caffe Nero or Pret – or any number of independent coffee outlets, take the trouble to “do the right thing” with the empty cup. We throw it into the street bin marked “mixed recycling” – or even take it to work and put in the recycling bin there. “The truth is,” says Hugh Fearnley-Whittingstall, ”they are barely recyclable at all – in the everyday, commonly understood sense of the word. They cannot be recycled through any of the normal public waste collection services - who are consistently diverting them to be incinerated or sent to landfill. There is, however, a company using a specialist facility in Cumbria called Simply Cups that recycles a small number of cups from a few companies – including some from Costa and McDonalds. “I’ve been in touch with Simply Cups,” says Hugh, “and the total they handle is still less than 6 million a year - less than ¼ of one per cent of the cups we throw away. Hugh has asked Costa and Starbucks to discuss the problem of cup disposal in a filmed interview for the next episode of his series, Hugh’s War on Waste. Costa has refused. Starbucks have agreed to an interview in principle, but have yet to give a date. So on Monday 14th March, Hugh is taking to the streets of London aboard his specially designed “coffee cup battle bus” – built with the help of students from Central Saint Martins, UAL, in London. He will be stopping outside Costa and Starbucks branches along the way, to talk to the coffee buying public and enlist their support to challenge the big names of coffee to clean up their acts.